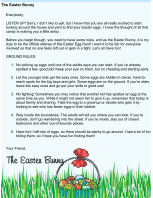 This printable letter from the Easter Bunny is intended to help keep the magic alive for an older child who may question belief in the Easter Bunny, and it also cautions the child not to share those doubts with young believers. It's almost here! My favorite time of year: Easter. Sure, it's a lot of work for me-all that hopping around. But I'm the Easter Bunny and that's my job. 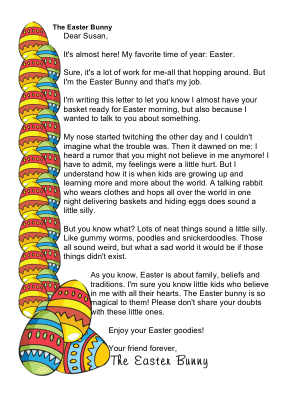 I'm writing this letter to let you know I almost have your basket ready for Easter morning, but also because I wanted to talk to you about something. My nose started twitching the other day and I couldn't imagine what the trouble was. Then it dawned on me: I heard a rumor that you might not believe in me anymore! I have to admit, my feelings were a little hurt. But I understand how it is when kids are growing up and learning more and more about the world. A talking rabbit who wears clothes and hops all over the world in one night delivering baskets and hiding eggs does sound a little silly. But you know what? Lots of neat things sound a little silly. Like gummy worms, poodles and snickerdoodles. Those all sound weird, but what a sad world it would be if those things didn't exist. 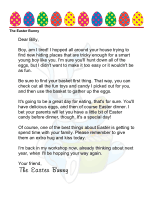 As you know, Easter is about family, beliefs and traditions. I'm sure you know little kids who believe in me with all their hearts. The Easter bunny is so magical to them! Please don't share your doubts with these little ones.